In United States, Almost all of us have “Benadryl” in our first aid kit to treat the allergies and variety of other symptoms. We know it’s safe. So at times, we also share some of our Benadryl with our beloved pets. However the questions like, “Can I give my dog Benadryl, is Benadryl safe for dogs” arise in every pet owner’s mind every now and then due to the fact that these meds are not exclusively made for dogs. Fret not! We tell you everything you need to know about the Benadryl stuff. We love dogs as much as you do. That’ s the reason why we crafted guide with extreme care. 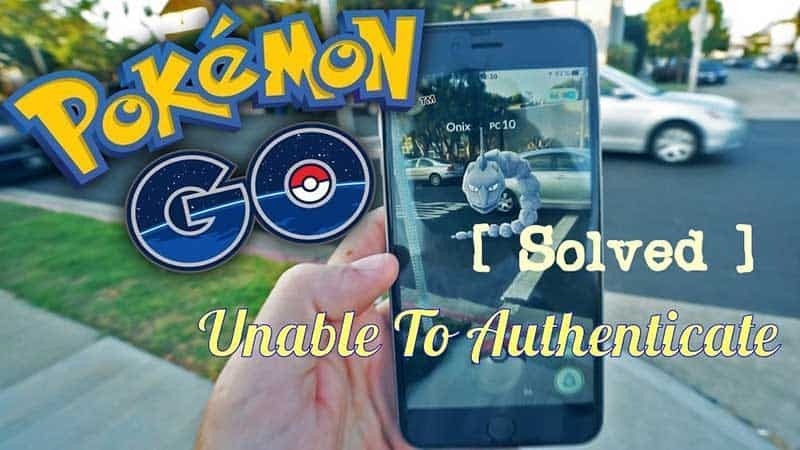 As every section contains important information, we recommend you to not to skip any part of this guide. Start reading now. Benadryl is not the name of the drug that is used for treating dog allergies. It’s a brand name and it’s often to denote the formulation called diphenhydramine. Though it is made for humans, it is completely safe for the pet animals. Besides to diphenhydramine, Benadryl designed for humans also comes in other formulations like acetaminophen or pseudophedrine which are identified as toxic to our pet animals. What Is Benadryl and How It Works? Benadryl a.k.a. diphenhydramine is an antihistamine. When something goes wrong with the body, the chemical known as histamine is produced as a part of local immune response. This chemical is responsible for creating the allergic reactions like itching and swelling. The diphenhydramine found in the Benadryl signals the brain to block the Histamine H1 receptor. As a result, it stops the histamine from triggering the alarming symptoms. The how to procedure described here is applicable for both humans and dogs. However, Benadryl for dogs is not yet been approved by FDA but still it is prescribed by most of the Vets just because of its harmless nature. Yes. You can but be careful with its formulation and dosage. Benadryl containing the active ingredients like diphenhydramine or cetirizine are safe for use on dogs. Cetirazine formulations are used to treat the itchiness and dermatitis. Whereas Diphenhydramine is used to treat the symptoms like insect stings, bites, swelling, motion sickness, congestion, coughing and sneezing. If you want to purchase 100% pure dog formulation of Diphenhydramine (Generic Benadryl, you can get it from 1800petmeds. Com. It is one of the renowned pet medicine stores online. Which Form Of Benadryl Should You Avoid? Some of the Benadryl formulations contain the active ingredients like Acetaminophen and Pseudophedrine. Though these are perfectly safe for humans, these are known to create adverse effects in our dog’s respiratory systems. also contain pseudoephedrine. 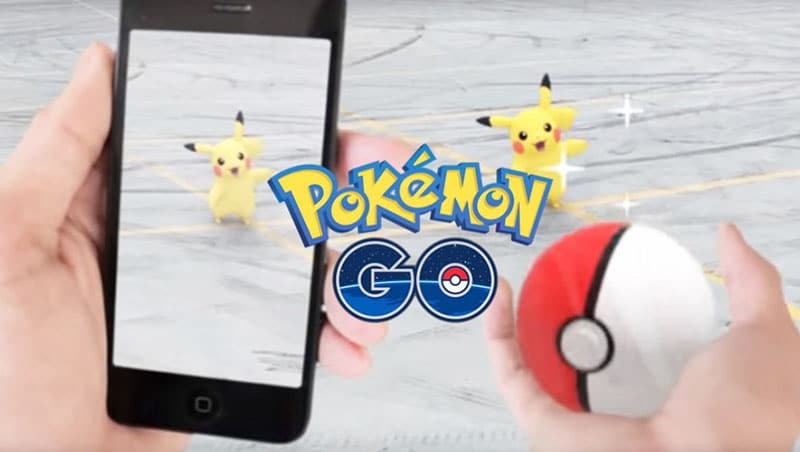 These are potentially dangerous to our pet animals on high doses. We insist again, before sharing some of your Benadryl with your pet please ensure that it contains only Diphenhydramine or cetirizine as its active ingredients. In some countries like United Kingdom, Benadryl products contain only cetirizine as main active ingredient. Diphenhydramine is no longer in use. However, these ingredients can’t be used like alternatives. Each one of them has their own purpose to serve. Read the packaging carefully and find out which ingredients are used in the formulation. Apart from Benadryl, there are many Diphenhydramine meds are out there that can help relieve the variety of symptoms in pet animals. We suggest you to talk with your vet and get a prescription formulation that is designed especially for dogs. 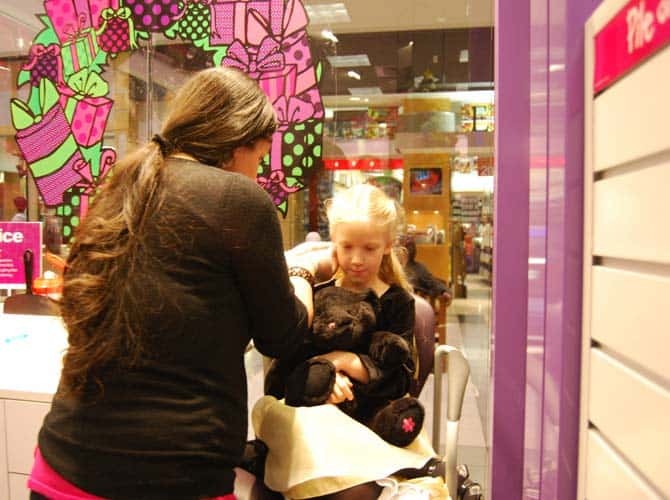 There are many situations in which you can use Benadryl for dogs. The most common usage is for treating allergies. Here is a complete list of symptoms that can be successfully treated with Benadryl diphenhydramine. Here is a complete list of symptoms that can be successfully treated with Benadryl Cetirazine. Benadryl products cannot be used to cure the brain or other tumors but it can be used to administer the dangerous effects caused by the excess release of histamine in the body. If your dog is suffering from excess stomach acid, giving Benadryl to your dog will help relieve the symptoms like loss of appetite. Remember it is just a temporary solution like a first aid. Seek a professional to get a proper relief. When Should You Not Use Benadryl For Dogs? Do not use Diphenhydramine to treat the dermatitis. It will not be an effective treatment. For dermatitis, consider using cetirizine or zyrtec. If you are not very sure about which OTC to use, having a discussion with your vet that will help you discover other options as well. Do not give Benadryl to your dog to treat the general anxiety. For such conditions, you can use Anxietrex or other natural remedies that assures 0 side effects. You can directly squirt this liquid into your dog’s mouth or you can give him with a mix of water. Watch him to stay calm and fix up an appointment with your vet immediately. This medication is completely safe for dogs of all age groups. Do not use Benadryl, if your dog has the following pre medical conditions because Benadryl can interact with the drugs given for these diseases. Benadryl can’t be used with the pregnant or nursing dog. It is not recommended to decide the dosage level by yourself without consulting your veterinarian. Because he is the only person who can provide the dosage recommendations based on your dog’s age, breed current condition and the previous medical history (If any). Check with him once so you can repeat the same dosage when next time your dog come up with the same situation. The dosage level described below is for Benadryl tablets and Liqui-gels that contain with diphenhydramine as main ingredient. We assumed that your dog is healthy and not taking any medicines that could contract with Benadryl. General recommendation of Benadryl dose for dogs is 1mg/lb. You can repeat this dosage once in every 8 to 12 hours. Approximately, 2 to 3 times a day. This dosage can be adjusted by a vet based on your dog’s age and its condition. Sometimes even it can be doubled like 2 mg / 1 lb based on the demanding situation your dog goes through. But again, it should only be determined by your vet. The table below shows the recommended dosage for Benadryl diphenhydramine. Benadryl tablets come in 2 different tablet forms 25 mg and 50 mg. If you have small dog like Yorkshire Terrier which weigh around 6 to 7 pounds, it will become impossible to divide the pill into pieces. So to avoid the complications, it is often recommended to use the Benadryl’s children’s formula. There is another reason behind this recommendation, Children’s Benadryl are designed to be free from dyes and alcohol in their formulation. These are much safer than the adult versions. 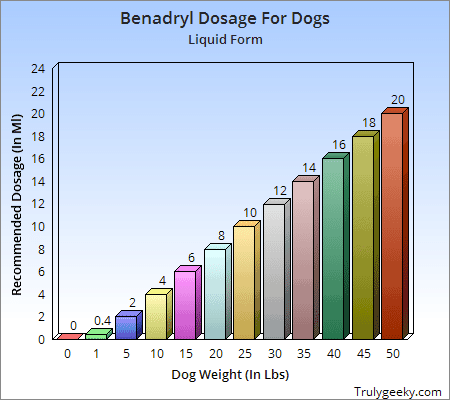 If you decide to give Benadryl to a dog in liquid form make sure that you are dosing 0.4 Ml per 1 Pound. 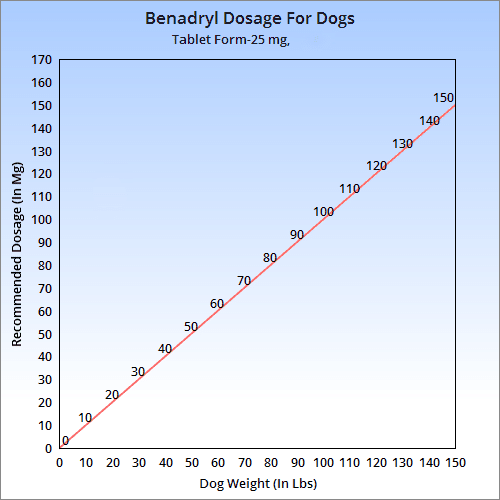 If your dog’s weight is 10 lbs then the Benadryl dosage should be 4 Ml (10*0.4). You can repeat the dosage up to 3 times a day in every 8 hour interval. To measure it more accurately, you can use either an eye dropper or syringe without needle. If you have to use Benadryl to treat dermatitis in dogs, find a formulation that contains Cetirizine as active ingredient. You can regulate the dosage as in the table below. You should dose your dog with Cetirizine only once per day. How Long Does Benadryl Take To Work? Once Benadryl enters into the body either in a pill form or in a liquid form, it will not take more than 30 minutes to start reacting. So if you plan to give Benadryl to your dog to treat travel anxiety, dose your dog with Benadryl half an hour before the journey schedule. Since liquids can reach out the blood stream faster than the tablets or capsules, to fasten up the recovery, it is suggested to use the liquid form. You asked can I give my dog Benadryl and we said “yes”. There is no denial. However, dogs that receive diphenhydramine or Benadryl may or may not exhibit some side effects. But you don’t need to worry about it much. Side effects are usually start to arise within 30 mins of taking the medication. These will usually be mild and will go away on its own. If your dog seems to be depressed or exhibit the serious symptoms like vomiting, contact your veterinarian immediately. Though Benadryl is often recommended by the vets themselves for treating allergies and sort of other conditions, overdosage could land your dog in some serious trouble. Pet owners will never overdose their pet intentionally but the incidents of over dose do happen. We all know that, our pets will show a keen interest on the things that should not to. We know the story of a young Labrador retriever who ate Benadryl 16 times more than the safety margin. This lab has survived the over dose with on time hospitalization. So if your naughty pet drinks up or ate the excess Benadryl without your knowledge and shows up the following symptoms, act up quickly so you can save his life from the consequences. 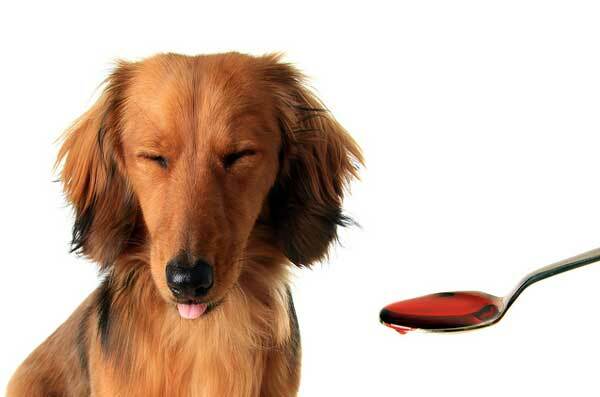 Symptoms of Benadryl overdosage for dogs can vary from moderate to severe. High blood pressure occurred due to the overdosage may make your dog end up with circling or seizures. So watch out your dog’s behavior closely. If you suspect an overdose with Benadryl for dogs, reach out the “ASPCA animal poison control” hotline (888) 426-4435 or contact your veterinarian immediately. Hope we have given the contended information for your query “Can I Give My Dog Benadryl“. Tell us have you ever been used Benadryl for dogs? If so, How it worked? yes, cats can take Benadryl. Make sure to give them the Diphenhydramine formation.